The randomized control trial investigates the use of a cash-transfer program amongst low-income households in Western Kenya to determine the causal association between poverty reduction and psychological well-being. The innovation content for the RCT consists of cash transfers distributed to a group of low-income households by the GiveDirectly program. The approach aims to reduce poverty and poor psychological well-being, including stress, unhappiness, and depression through cash transfers. 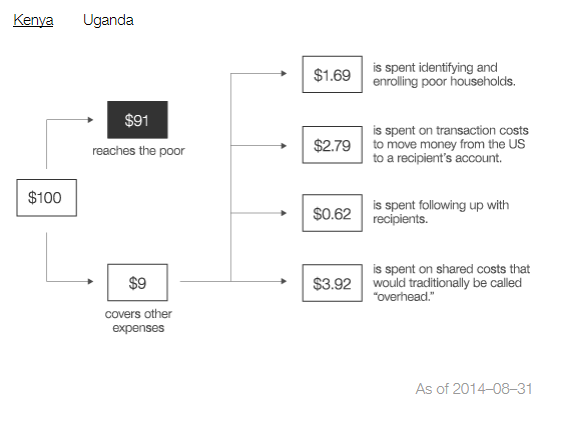 "In 2011, 503 households, received an “unconditional cash transfer” to spend as they wished. Many made major life changes, such as purchasing tin roofs and livestock. Recipient households experienced improved mental health, notably reporting less stress, depressive symptoms, and intimate partner violence and greater happiness and optimism." Target: Using publicly available data to determine extremely poor communities, field staff go to households to collect data on poverty and enroll recipients. Audit. A set of independent checks determine recipient eligibility. Transfer: An estimated $1,000 is transferred to households (around one year’s total household consumption), using electronic payment systems. Recipients receive an SMS alert to collect cash from a mobile money agent. Monitor: The organization monitors receipt of funds and flags any issues. Cash Transfer tools: GiveDirectly manages transfers end-to-end using electronic monitoring and payment technology. Treatment group: Low-income households, as determine by GiveDirectly eligibility criteria, in Western Kenya receiving direct cash transfers in the amount of $404-1525 USD. Pure control group: Low-income households, as determine by GiveDirectly eligibility criteria, in Western Kenya not receiving the intervention and not residing in villages where other households received the treatment. Along with other financial outcome measure, an index of psychological wellbeing was assessed and included a CES-D depression questionnaire, cortisol levels, and measures of optimism, self-esteem, life satisfaction, worries, perceived stress, loneliness, trust, locus of control, and happiness. The RCT utilized the program GiveDirectly which manages cash transfers from funders end-to-end using electronic monitoring and payment technology within low-income populations in Western Kenya. Additionally, m-Pesa a mobile phone-based money transfer service, allowed for recipients to receive cash transfers directly so that no third party was involved. The GiveDirectly cash transfer program has been designed, implemented, and evaluated in East Africa and continues to gain funding support from various partnering organizations. The organization collaborates with third-party independently funded researchers to measure its impact in low-income communities in Kenya and Uganda. The organization plans to scale up in these regions and hopes to expand to other geographies with extremely poor populations. Each cash transfer to a recipient was between $404-$1525 USD for an average of $717 USD. GiveDirectly has a 9% overhead, giving 91 cents for every dollar donated directly to the recipient. The organization continues to be funded by partners and various donors. The average score on the CES-D depression questionnaire was 26.5 in this population, above the clinical cut-off point for depression of 16 established in Western populations. The impact of the initiative resulted in improvements in this measure: recipients scored one point lower on the depression scale than non-recipients, and also showed improvement on several other measures of psychological wellbeing, such as perceived stress, life satisfaction, happiness, and optimism. Greater psychological effects were found amongst households that were given large ($1,500) compared to small transfers ($404). Cash transfers proved an increase in psychological well-being of recipients and their families. Un- conditional cash transfers lead to a 0.18 SD increase in happiness, a 0.15 SD increase in life satisfaction, a 0.14 SD reduction in stress, and a 0.99 point reduction in scores of the CESD depression, all measured by psychological questionnaires. Amongst households that received large transfers, researchers found a reduction in cortisol levels, which were captured in log units and therefore not as readily interpretable. In households that received large transfers compared to small transfers, female-recipient compared to male-recipient households, and transfers delivered in a lump-sum compared to in monthly installments. A greater improvement in psychological well-being was found in households where females received cash transfers, compared to when transfers went to men. Female empowerment may partly account for these observed differences between female- and male-recipient households: female empowerment, as measured in part by the absence of physical and sexual violence against women, was improved in the treatment group, and particularly in female recipient households. In the cross-section, female empowerment is a strong predictor of psychological well-being. The results of the RCT suggest that future research is needed to determine whether addressing mental health directly through a psychological intervention, or addressing a root cause of poor mental health—financial strain—is most cost-effective for improving mental health. Additionally, future research should aim to determine whether enhancing psychological wellbeing in turn might have positive effects on household wealth. Ideally the study should be duplicated in other populations. A long term evaluation of the program has been conducted in 2015 and the results will be released in 2016.